Major challenges to the future well-being of our planet and its inhabitants can only be properly addressed through scientific research and innovation breakthroughs. Fully in line with priorities of Horizon 2020 SBSM offers strategic and operational contribution to RRI activities in the research and innovation process in order to better align both the process and its outcomes with the values, needs and expectations of society. We are supporting scientists as a partner in your project or as a consultant in the fields of innovation management, standardisation / data management all RRI connected activities (public engagement, open access, gender, ethics, science education) as well as in the overall scientific management. 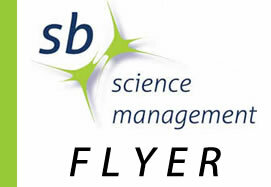 The team of SBSM provide both long-term experience as active scientists and in scientific management. Inspired by the passion for what we do, we also contribute and support you with services for the planning, initiation, and implementation of national and international collaborative research and innovation projects. Our passion is to strive for top quality in all we do.